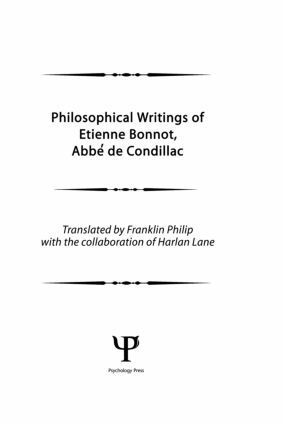 This highly readable translation of the major works of the 18th- century philosopher Etienne Bonnot, Abbe de Condillac, a disciple of Locke and a contemporary of Rousseau, Voltaire, and Diderot, shows his influence on psychiatric diagnosis as well as on the education of the deaf, the retarded, and the preschool child. Published two hundred years after Condillac's death, this translation contains treatises which were, until now, virtually unavailable in English: A Treatise on Systems, A Treatise of the Sensations, Logic. "Condillac…a major figure in the critique of rationalism and the development of philosophical empiricism and empirical psychology. The translations are excellent and preserve the clarity and elegance of the originals. Thus, they provide an invaluable resource for the study of the Enlightenment. Moreover, these works are philosophical classics that can contribute to contemporary discussions on the philosophy of mind, personal identity, epistemology, and cognitive psychology….Recommended for both graduate and undergraduate libraries." "Philip and Lane have provided a clear, accurate rendering, faithful to the vocabulary and sentence structure of the original and conveying Condillac's crisp, analytic style."